Sky Hostel Almaty i Almaty, Kasakhstan: Reservér nu! 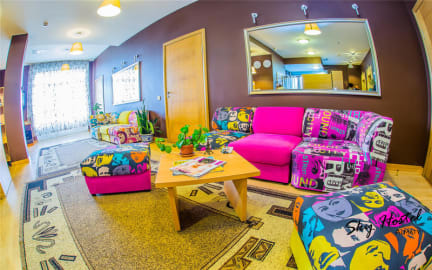 Sky Hostel Almaty is located in the heart of Almaty, the 5-minute walk from the metro station 'Baikonur', the river Esentai, Sports Palace, Pool, circus, amusement park, park named after A.Baytursynova, Mall'Promenade',close to Republic Square, State Art Gallery. The Sky Hostel offers free Wi-Fi and 24hours front desk. Bedding sets and towels are provided free of charge. Guests can prepare their own meals in the fully equipped shared kitchen with dining area. Terrace on the 11th floor opens the wonderful view to the city. Next to the hostel located swimming pool, nearby 2 more pools. On the 12th floor is fitness club. A bright and stylish rooms at the combine modern elements of the interior with a homey feel. Each of the room have a private bathroom and air conditioning. 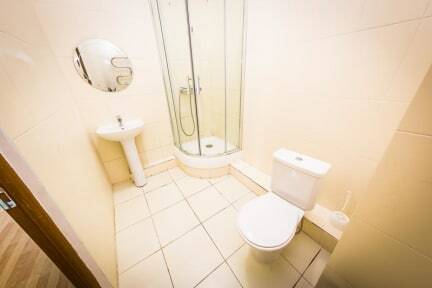 In the corridor equipped shared bathrooms for the convenience of visitors. Luggage storage and lockers for free. 24-hours security. All beds equipied with individual lamps. You can get free earplugs. Laundry and daily cleaning, hairdryer, ironing. Also we can organize tour of sights, transfer from the airport, taxi in the city. You can relax on the sofa in the living room and watch TV, order a movie or play board games.